Francine's Friends received $24,000 from the Fort Wayne Chapter of "100+ Women Who Care" on January 6, 2015 at the Kroger Store on North Clinton. 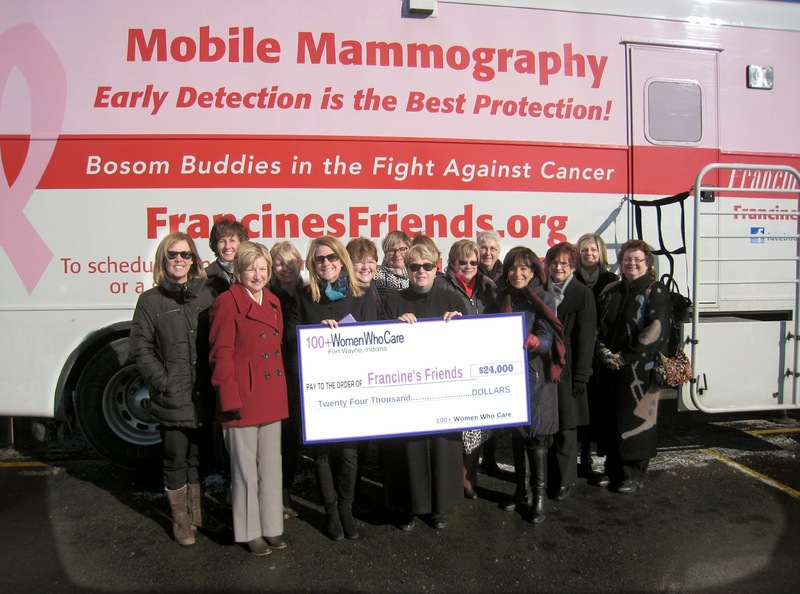 Francine's Friends received the 2014 4th quarter donation from the group. The 100+ Women Who Care website describes the organization as "an exciting group of women coming together to make a difference in our local community. The group gathers four times a year for a one hour meeting, and each member writes a $100 check to a local 501(c)(3) organization that the group selects. This combined donation makes a real impact." Recently, Parkview Hospital started matching contributions by $10,000 per quarter to help make the 100+ Women Who Care contributions more impactful. For information on how you can become one of the 100+ Women Who Care, visit the website at 100pluswomenwhocarefw.org. Thank you 100+ Women for making a HUGE impact through screening mammography!